Please refer to our stock # T 1763 when inquiring. Circa 1900 brass sash pin with Art Nouveau meandering lines on Arts & Crafts weight construction and an old C catch. 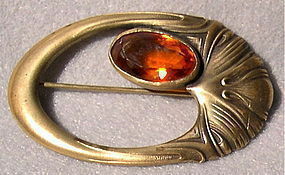 Showing the bezel set facet amber glass stones often seen on George N. Steere or GNS & CO work. While not his usual figural critter piece, this brooch displays the same finish, same size and color stone (25mm x 15mm), reticulated metal design. Seasoned collectors familiar with Steere's work often embrace his unsigned pieces. Solid construction, heft and Art Nouveau lines that all scream, "look at me, I am an unsigned George Steere piece!" 2 3/4" X 1 5/8" and weighs 26 grams. In wonderful preowned 100+ year old condition - see image 1. View all images to compare this to a signed piece by this maker: images 4 - 8 (the signed piece is sold). For more info on this proposed maker, please see blog on any page, here at www.mimideeartwear.com.